The Philips dictation and transcription set allows you to turn voice into text even quicker than before. The Pocket memo digital voice recorder combines two microphones for superior audio quality with a robust yet lightweight ergonomic design. 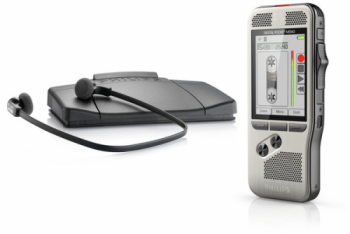 Together with the user-friendly software and convenient foot pedal, dictation and transcription has never been easier. Product dimensions (W × H × D): 19.5 × 13 × 3.5 cm/7.7 × 5.1 × 1.4 in. Speaker diameter: 14 mm/0.6 in. Cable length: 3.0 m/10 ft. Product dimensions (W × H × D): 16 × 15 × 1.8 cm/6.3 × 5.9 × 0.7 in.